In this Lab, we will do control in the main function for the first time. Until now, we just have edited simple unit functions or some of main function for single use. However, In this Lab, we will write main function using Loop and if statement to be consistently implemented until user enter a specific value. It might be difficult, but as time goes, you will know this is one of the simplest lab assignments. Let’s start working on it with pleasure. First of all, you have to download the assignment template file. Please enter the below address on your Chrome or Explorer’s address bar. Click View Raw or Download button for downloading. Or click Lab 6 – download link and it will start download automatically. Move the downloaded lab_4.zip file to work folder and start the assignment after unzip the file. To understand a factorial calculator, which is the object of this assignment, we need to understand what factorial means first. Factorial means the result of multiplying all natural numbers from 1 to n. In other words, n factorial means 1 X 2 X 3 X ... X n and we also can express it with a sign such as n!. In case of 5!, it means 1 X 2 X 3 X 4 X 5which is120`. (from Wikipedia). For more detail, see the factorial page of Wikipedia. The actual program which we need to execute is the following. This program can be executed with three requirements. The program prints the factorial value after calculating when user enters positive natural number. In other words, if a user enters 5, 120 must be displayed on the next line. If a user enters other characters besides natural numbers or 0, it will print Input again, Please for get new input. When a user enters 0, the program finishes with showing a message Thank you for using this program. The logic itself is very simple and we can do it by what we have learned before. However, as this is the first assignment for Control, you can feel very difficult. In this Lab, That’s why i explain it in detail, so please read this document with care. Open factorial_calculator.py using atom to overview. When you open the file, you can see main function and is_positive_number, get_factorial_value functions. The list of functions for editing in this Lab is the same as below. is_positive_number Receives a string value. If the corresponding value can be converted to a natural number, return True. Else, if it is cannot, return False. get_factorial_value Receives a natural number and returns computed the factorial value of corresponding natural number. In other words, when 5 has entered, it should display 120.
main Print factorial values on the screen by receiving values from a user. As described on "Factorial Calculator Overview" instructions, the program should be ended if you enter 0. It should request to re-enter if entered value is not 0 or natural number. Let’s see the method of writing each function. The first function is is_positive_number function. It has already been written as below. A comment is included in actual codes but I omitted for explanation at this time. We’re start with pass part. You can see try ~ excpet ValueError. It is a "Exception Handling" syntax which is not necessary to know yet. Don’t care about it. The role of this syntax is to return False unconditionally if type conversion is not possible. For example, in case of trying int("abc") function with a string of "abc", it returns only False in the function thanks to Exception Handling. Converts the entered integer_str_value to a value of an integer type. Verify whether the converted value is a natural number. If it is returns True and if not returns False. If it is not possible to convert into an integer, it automatically returns False due to try ~ except statement. Now let’s write a code according to the purpose above. The second function is get_factorial_value. This function returns corresponding factorial value after receiving a natural number variable integer_value. As it only receives numbers already converted to a natural number, you do not need to verify the entered value. There are many methods to find a factorial value, but I recommend to use for statement since this is the simplest way of multiplying from 1 to a integer_value. In case of for statement using integer values, you probably use range syntax. but you should remember you must use range syntax as like : range(1,integer_value+1) as range(integer_value) starts from 0. Well, it is true that there are a lot of ways for finding factorial values. Therefore, it does not matter whether students use the above mentioned method. Just return a factorial value. The last function is the main function. The template of the main function is the same as follows. Note. The methods explained in this Lab are just one way of implementing the assignment. Therefore, if you have any other ways to achieve the object, you can use your own method. The below explanation is a guideline for execution. You cannot write codes correctly if there is no understanding of loop or if statements. So, please start writing a code after understanding the guideline. The main function starts with user_input = 999.The user_input is the variable which receives values entered by the user. If you think that user_input is not necessary, you can delete it. user_input = 999 stated is for while statement. In this lab, the end condition for while statement is 0 as explained below. Therefore, I assigned 999 to user_input for the first initialization. As I already have explained before, if there is no a specific number of repeats for ending in Loop statement, it would be a good choice to use a while statement. It has a condition that “it ends when the user enters 0”, so you would start the statement with while(user_input is not 0):. The first thing you need to do after executing while statement is to receive values from the user. You can use input("Input a positive number : ") statement for entering and the entered value will be assigned to user_input variable. For the next step, use if statement and is_positive_number() function to verify whether you can calculate the factorial value of entered values. if is_positive_number(user_input):, statement will return True when the entered value is a natural number and ‘False’ if it is not a natural number. If the returned value is True, it converts the user_input value to an integer and returns a factorial value of user_input using get_factorial_value() function and displays it on screen. If the returned value is False, verify whether the corresponding value is '0' which is end of program. You can use a syntax such as elif user_input is '0': . When you assign 0 on variable user_input, program will be go to out of while statement according to the condition of while statement. Of course, you must display a string Thank you for using this program before ending the program. If the converted value is False but user_input is not 0, print Input again, Please on the screen. In this case, use else: statement if you are not meaning the above conditions. The program will work continuously if user_input is not '0'. The above explanation is very complicate. It would be very hard to you to execution if you are not well understood of if, while statements. Therefore, you must practice and repeat the lesson several times for executing. 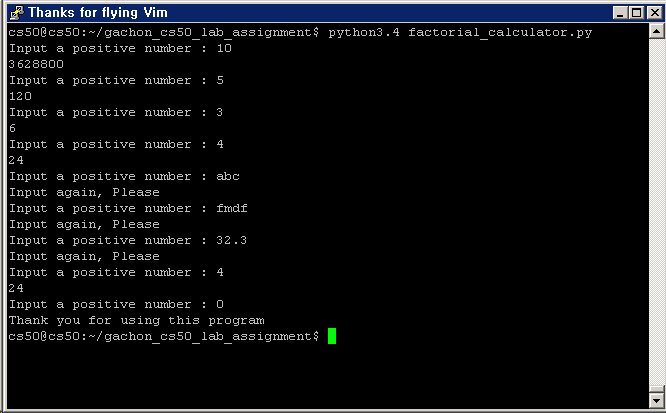 You can see the python factorial_calculator.py as below when your code is completely written. Of course, you need to enter all values for users for executing. All lab assignment has completed. Let’s submit it. Press windows+r and enter cmd and click OK.
Change directory to working folder. Enter below code on cmd window. After entering above command, you will see the screen as below with Login ID and Password. Enter Login ID and password which we used for registering http://theteamlab.io website. Note. You can submit lab assignment any time. And you will be able to see the below message if it is correctly written. Congratulation. It is the first time you actually making a program for executing. while, if, for in this Lab are used in all programs we frequently use such as web browser, excel, power point, etc. You may feel too hard and challenging but in reality, it is a simple assignment. Trust me and next week you will experience what the hell looks like.